With great power comes great responsibility. Learn how to safely unleash the powerful new security features in Windows 10. Microsoft has levelled up security capabilities with Windows 10. Virtualization-based security, kernel isolation, recursive data encryption, and Defender’s new cloud brain with block-at-first-sight capabilities are just some of the enhancements. However, this progress also brings challenges for IT and security teams - challenges that could be avoided with the right information. 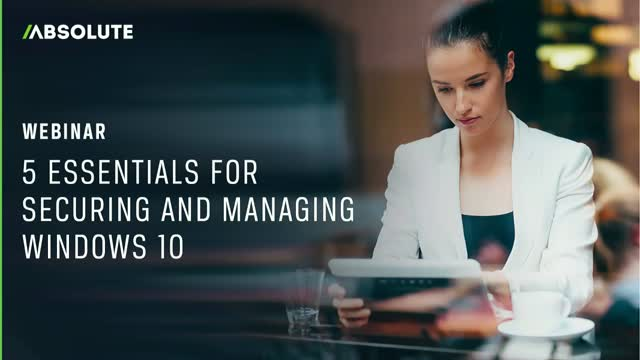 Whether your project is in the planning stages, already underway, or close to completion, this one-hour investment will pay dividends during your migration and beyond, as we share how to best deploy and utilize the many security enhancements in Windows 10, while avoiding common – and costly! – migration pitfalls. New endpoint risks discovered in a study of more than 6 million devices. Global cybersecurity spend is up – way up. Yet, 77% of IT and security teams report having little-to-no confidence to prevent or mitigate cyber risks. Why is that? Unmask true risk in your device population, and discover actions toward real-world resilience. Don’t miss The State of Endpoint Security in 2019. Maximize Absolute for IT asset management across your organization. Learn Absolute’s best practices for deploying, managing, monitoring, and decommissioning your IT assets. The investment your organization expends in acquiring and securing IT assets is substantial; therefore, the management and governance of them is critical. As an Absolute customer, there’s a lot you can do to keep your devices safe, visible, and under your control at all times. In this webinar, we will explore how to optimize Absolute to effectively manage your assets throughout their lifespan and extend their value. From initial deployment to the eventual end-of-life process, find out how to use Absolute to its fullest in order to maintain the integrity of your devices. > Mitch Kelsey, Lead Consultant, Risk and Security Solutions at Absolute. With a background in strategic risk management, threat analysis, and project implementation in North America and the Middle East, he delivers assessment and advisory services on Risk and Information Security issues for Absolute’s customers in both the public and private sectors. > Dean Fogarty, Director, Information Technology at Absolute. Dean and his team are responsible for managing the assets distributed across the Absolute organization. They leverage the tools available in the Absolute console to track their inventory of assets to ensure that they maintain a healthy and protected state throughout their lifespan. Fast-track your understanding of cybersecurity, data regulations, and cybersecurity frameworks with the Cybersecurity Insights series from Absolute. In the first episode, Absolute’s Director of Security Strategy, Josh Mayfield, reveals what healthcare IT and security teams need to know to better protect sensitive personal health information (PHI). In the second episode, Josh explores the HIPAA Security Rule to find out how to protect your organization’s personal health information (PHI). We outline the three safeguards of the HIPAA Security Rule: administrative, physical and technical. The Security Rule Safeguards are legal requirements that must be adhered to. The right technology can shield our most valuable data and help prove compliance should a data breach occur. Watch these episodes to learn how you can maintain line of sight on all your devices to achieve continuous compliance, mitigate the risk of a breach and avoid costly penalties from the Office for Civil Rights (OCR). >>To watch the rest of the series, please visit our YouTube Channel. Learn the must-have items to include in your plan. The moment you realize a cybersecurity incident has occurred is critical. Reacting in panic can create more harm and expose your organization to further liabilities. You need a tested cyber threat response plan at-the-ready to jump into action immediately and neutralize the threat. Before it takes control. SANS Institute and Absolute have teamed up to assemble the key components you need to include when building your plan. Having a checklist ensures that you don’t miss an important step. Register for this webinar to find out the must-have items to include in a cyber-threat checklist and, ensure that never happens again. It’s inevitable. At some point, a device in your organization will go missing, by accident or by design. The question is, are you prepared? Minimizing risk from data exposure and maximizing the likelihood of recovery means having a defined plan – and the tools to execute it. Whether your priority is recovering your asset, protecting your data – or both – the good news is, as an Absolute customer, those tools are already in place. While much of the content is tailored to existing users, all attendees will gain valuable insight into Absolute's unique device recovery and remote security capabilities. > Mark McGlenn, Senior Manager of Risk and Compliance Services at Absolute. Mark has over 15 years of experience in Internal Audit, Compliance testing, Risk Management, IT Security, Accounting, and Fraud Prevention. Leveraging best practices such as CIS Critical Controls, NIST CSF, and NIST 800-53, Mark has designed cyber-security assessment procedures and performed engagements in both the public and private sectors. > Andy Lee, Manager of Technical Support at Absolute. Andy has an extensive background in e-commerce fraud and financial services. His passion is in how security policies and best practices are connected to positive customer experiences. Since joining Absolute in 2010, Andy’s customer-centric focus has allowed him to develop a deep understanding of the different challenges and use cases customers face and how Absolute can help them. Healthcare is data. Every stitch of a patient’s health record, diagnoses, treatments, and provider interactions are fueled by information. And with PHI, IP, and other sensitive information readily accessible on all types of devices, it’s no wonder that healthcare and life sciences organizations are now prime targets for cyber criminals. In this webinar, you’ll drop in on a conversation between Dave Shackleford, Analyst and Senior Instructor at SANS Institute; and Absolute’s Josh Mayfield, Director of Solutions. They will discuss the key steps required to keep sensitive healthcare data safe and avoid disastrous data breaches. Whether for GDPR, HIPAA, or other regulations, successful compliance initiatives require knowing the location of your sensitive information. But with mobile workforces equipped with devices that go off-network every day, is that even possible? For most organizations, the reality is that critical data resides on endpoints they can’t see or secure. Make sure your organization is always audit-ready, and avoid data breaches and compliance-related penalties. The NIST Cybersecurity Framework (CSF) is the chosen path for thousands of organizations. Why? Because resilience is their most critical need in the face of changing threats, ever-present vulnerabilities, and a sprawling attack surface. NIST CSF provides a blueprint for cyber resilience. But turning theory into reality can be a challenge. In this webinar, you’ll drop in on a conversation between our featured guest, Forrester’s Renee Murphy, Principal Analyst for Security and Risk; and Absolute’s Josh Mayfield, Director of Solutions. They will discuss the clear and tangible steps at work within leading organizations pursuing NIST CSF. What is the real value of deploying an endpoint visibility and control platform? Which benefits and risks should your organization anticipate? That’s what we commissioned Forrester Consulting to quantify for The “Total Economic Impact™ of the Absolute Platform,” a 2018 study. Watch now to better understand the financial and business benefits that can be realized by the Absolute platform. When it comes to endpoint security, the playing field has changed. Threats are more dangerous and prevalent than ever before. Global security standards are more rigid, and the penalties for non-compliance more severe. Yesterday’s security strategy isn’t going to protect you from tomorrow’s attacks. Learn the key strategies for building and maintaining a comprehensive ecosystem of management and security controls for all of your endpoints. Register to watch this webinar now. Las estrategias tradicionales de protección de dispositivos están perdiendo la batalla. Los ataques son incesantes y cada vez más sofisticados. Esto ha aumentado la exigencia de los profesionales de seguridad y obliga a las empresas a adoptar nuevos paradigmas que faciliten que los sistemas se auto-recuperen. Para frenar las fugas de datos, debemos ser más inteligentes al detectar y responder a las amenazas. Este oportuno webinar de Absolute explora cómo conseguir que sus sistemas se auto-recuperen y que estén preparados para enfrentarse a amenazas cambiantes. When endpoints go rogue or become invisible, you need to act quickly to protect your organization and mitigate risk. But with limited visibility and a lack of dependable deployment methods, that hasn’t always been possible—until now. Find out how to ensure protection in the event of emerging threats, such as ransomware and other endpoint vulnerabilities. Register for the webinar now. Just how dangerous, inefficient, and ineffective are the endpoint security solutions used in most organizations today? Ponemon Institute independently surveyed hundreds of IT security professionals to find out — and are ready to share the surprising results in this important webinar. Enforcement of the EU General Data Protection Regulation (GDPR) is looming, giving you less than 12 months to prepare. And it has major implications for every organization that processes EU personal data – regardless of where they are based. With the cost of non-compliance set at an astronomical 4% of global annual revenue – not to mention damage to reputation – the time to protect yourself is now. Traditional strategies for protecting endpoints are failing as attacks increase in relentlessness and sophistication. This reality has elevated the demands on security professionals and requires that organizations adopt new security paradigms that unlock the power of self-healing systems. To stop security breaches at the source, we must become faster at intelligently detecting and responding to threats. This timely webinar from Absolute explores how to realize self-healing systems in your own organization and ensure preparedness in the face of evolving threats. Security and risk professionals are dealing with staggering amounts of endpoint-related data loss and risk exposure. To help mitigate these risks, security pros need to rethink their current endpoint security strategies and move past traditional security technologies. Join guest speaker Chris Sherman, Senior Analyst at Forrester Research, as he discusses Forrester’s "Targeted-Attack Hierarchy of Needs”. In this webinar, he will highlight the core endpoint security needs critical to an enterprise security strategy. Attendees will learn how to deal with the multitude of threats targeting their user endpoints through a balance of attack surface reduction and threat detection, with orchestration and automation as key components. Financial organizations are entrusted with the some of the most sensitive data and face a constant onslaught of attempts by insiders and hackers to steal incredibly valuable and easily monetized data. In this informative webinar, Kim Ellery, Director Product Marketing at Absolute, will discuss the increasing risk from both advanced attacks and insider threats. Attendees will gain actionable insights on how to balance the emphasis between detecting threats and preventing them in the first place, starting with visibility and actionable intelligence, to gain complete visibility and control of every endpoint device … no matter if they’re on or off the network. Absolute provides persistent endpoint security and data risk management solutions for computers, tablets, and smartphones. Absolute Data & Device Security (DDS), formerly Computrace®, is an adaptive endpoint security solution. It provides a persistent connection to all of your endpoints and the data they contain which means you’re always in control, even if a device is off the network or in the hands of an unauthorised user. The ability to communicate with your endpoints – regardless of user or location – means you can receive timely device and event information. Most importantly, you can apply remote security measures to protect each device and the data it contains. No other technology can do this. With patented Persistence® technology, you can consistently assess risk, secure the lifecycle of each device, and pre-emptively respond to security incidents. Not every security incident is a disaster but until you can determine the nature of an event, you need a dependable, non-invasive way to monitor and protect your organisation. Persistence® technology by Absolute provides you with a two-way connection to each device so you can receive alerts, assess scenarios, and apply an appropriate response. This adaptive security model provides you with coverage for the most hostile (and mundane) events. Absolute Persistence technology is built into the firmware of over half a billion devices worldwide. Once the software agent is installed, Persistence® is activated and the agent transmits device information to IT so they can remotely track, manage, repair and secure devices. Even if the firmware is flashed, the device re-imaged or the hard drive replaced, the agent will simply reinstall.